If you’re craving sushi, and you like California rolls, then try out this recipe! It has all the flavors of sushi but without the rice! 2 large Avocados, halved, seed removed, and peeled, but kept in tact. In a large bowl, mix together the crab, cream cheese, mayo, Sriracha, cucumber, and chives. Stir well until combined. Scoop out a little of the insides of each avocado half. Set extra insides aside (or just eat!). Sprinkle a pinch of sea salt over the avocado halves. Stuff 1/4 of the mixture into each avocado half. 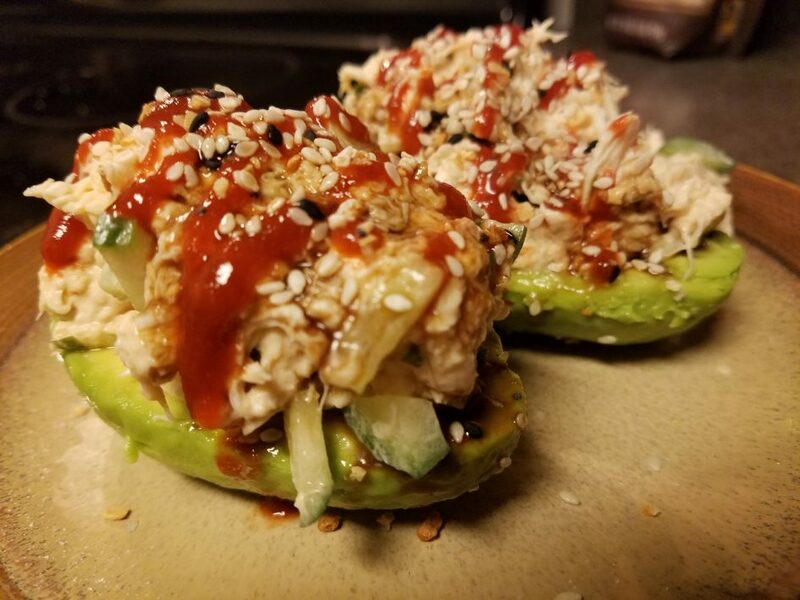 Drizzle 1/2 tsp of more Sriracha over each avocado half.